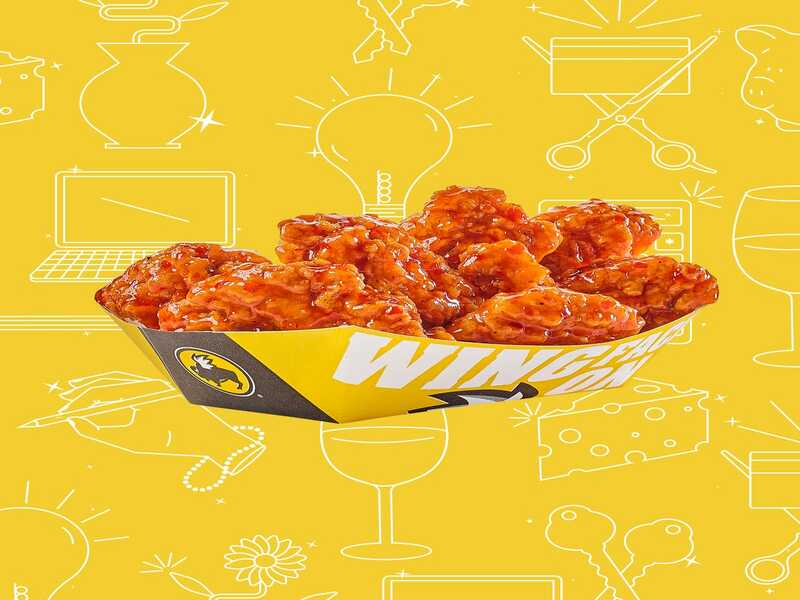 Today: a community nutrition educator working at a nonprofit who makes $35,048 per year and spends some of her money this week on Buffalo Wild Wings. 6:30 a.m. — I wake up to my alarm at 6:30. I stayed up too late last night watching The Office, which I admonish myself for even though I know that won’t stop me from doing it again. My dog knows that my alarm means wake up time, so she jumps into my arms for cuddles. I put my outfit for today out last night, so I throw my clothes on, pour iced coffee that I made earlier into my travel mug, and pack my breakfast (yogurt, chia, and strawberries) and lunch (PB&J with homemade peanut butter). 7:15 a.m. — I drive to work and get there by 7:30. The morning is pretty slow, but I work on my to-do list for the week, as I have events and a meeting I need to work around. Once the school year starts I’ll get busier. I email people asking for letters of recommendation for a masters program I’m applying for. I’m nervous — reaching out to them makes it so real. I forget my yogurt in the fridge and eat some granola bites that I keep in my desk. 4:30 p.m. — I work until 4:30, an eight and a half hour day. I usually work an extra 30 minutes on Mondays through Thursdays so I can flex my time and leave at 1:30 on Fridays, however this week I’m using the flex time for two doctor’s appointments. After work I head home and assess the food situation in the fridge. We’re running low, so I will probably need to go to the store soon. There’s a banana that’s about to turn bad in the fruit bowl on the counter which I use to make a protein smoothie. 6:30 a.m. — My alarm goes off at 6:30. The dog wants to play, so I spend 15 minutes petting and snuggling with her in bed. After my snooze alarm goes off at 6:45, I throw on the outfit (including the headband I just bought) that I laid out last night. My brain just does not work in the morning, so I always try to plan ahead. I get a little distracted this morning, until I finally manage to run out the door with my caprese salad and a green smoothie I had in a mason jar in the freezer. 7:45 a.m. — I’m running 10 minutes late, but luckily nobody is really at the office to notice yet. I spend my morning organizing paperwork and prepping materials for my class tomorrow. Someone brought brownie brittle to the office, so I take a piece and have it with my smoothie. Balance, right? Lol. For my morning break, I join some coworkers for a 15-minute walk around the building. 12:30 p.m. — After lunch we have a two-hour conference call with our state office. Most of the information doesn’t apply to me, so it’s really hard to pay attention. One of the researchers in the office next door brought a tub of fresh moringa and offers me some, so I take a bunch. Then I Google ways to cook and dry moringa while I’m at my desk. 7 p.m. — When I get home, I wash the moringa from earlier and hang it outside. Hopefully it will dry well so I can make it into a powder for adding to other foods. I feel bloated from all the chicken wings, and talk myself out of going to the gym. Then I use a tennis ball to roll out my feet muscles and put on hair and face masks. It’s nice to practice self-care! After I shower, I play around on my computer and watch Netflix passively. I fall asleep a little after 10:30. 6:15 a.m. — I am up at 6:15 today because I scheduled myself to come to work at 7. I didn’t have to, but since I have to leave at 3 for a doctor’s appointment, coming in earlier keeps me from having to take sick time. I quickly throw on my clothes from last night and put my hair into a messy bun with a head wrap. I’m grumpy being up early and have a bit of a headache. I eat a plain bagel with green onion and cream cheese and the iced coffee I made over the weekend in the car on the way to work. Leaving at this time is great because I’m not fighting school traffic! 7 a.m. — I finish prepping food for my recipe demo in class today, and then catch up on my emails. I have to drive to the class site, but my employer reimburses me for mileage at the IRS rate. Because my car is newer and gets good mileage, I usually end up profiting slightly from the mileage reimbursement, although I know using my car for work will end up costing me years from now. 3 p.m. — I leave the office at 3 to get across town for my annual physical. I get a TB test, the HPV shot, and a shot for pneumonia. My doctor also sends me downstairs to get an X-ray of my wrist that has been bothering me for months. Hopefully, they can find what’s wrong. The appointment doesn’t cost anything, because my employer’s insurance has no copay for preventative care and I qualify for a financial assistance program with my income, so other necessary health services and medications have reduced fees or are free. 5 p.m. — I can’t get out of the gym today because it’s right across the parking lot from the doctor’s office. I change into gym wear, do some full body strength training, and then do 30 minutes of cardio on the recumbent bike. 6 p.m. — When I get home, I make lightly fried polenta and top it with homemade sauce I made yesterday with the tomatoes. (SO. MANY. TOMATOES.) I take the leftovers for lunch tomorrow. I also prep Crock-Pot chicken parmesan that I’ll take out of the fridge and start tomorrow. After I shower, I call my friend who lives across state to talk to her about some of my work drama and encourage her in her search for a new job. She is really encouraging to me about the master’s program I’m interested in and it makes me feel really good. Then I read a book about minimalism and get inspired to organize and declutter my dresser, so I choose a drawer to start going through. Finally, I fold and put away my clean laundry and go to bed around 10:45. 6:45 a.m. — I wake up for work after hitting snooze a few times. I put on a dress and headband that I laid out last night and throw a bagel in the toaster. I somehow managed to actually have time to eat my breakfast at the table. I say goodbye to the dog and head to work for the day. There’s a lot of traffic because the local university started it’s fall session today. 7:30 a.m. — When I get to work I rush to finish up some paperwork because I had put a training on my calendar for today. However, after asking around I realize I wrote the date wrong, and the training is next month! I take a mental break by reading some online New York Times articles, and then get back to work, although much less rushed now. 5 p.m. — G. meets me at my house at 4:30 because he was in town for errands again. We go to the gym together and then eat my slow cooker chicken parmesan and asparagus. After he leaves, I shower and read the minimalism book some more. I take the quiz inside that tells me I have a lot of clutter because my high energy has me taking on projects that I never finish, and I need to learn to say no. It isn’t wrong. I have so many half-finished projects! I take some time to work on my personal statement outline, and then hit the hay at 10:30. 6:45 a.m. — I wake up and feel exhausted. I didn’t sleep very well last night. I grab some iced coffee from the fridge and head to work, where I eat a granola bar at my desk. I double check to make sure I have all of the certificates of completion for my last class today. 7:30 a.m. — Once I grab the recipe demonstration food out of the work fridge, I drive to the site. The caffeine from the coffee lasts through the lesson, but on my way back I start to feel even more exhausted. 12:30 p.m. — Instead of eating lunch in the break room, I decide to eat my leftover chicken parm at my desk. A coworker comes by to see me — and bring me my purse that I left by the sink when I was doing dishes! I cannot believe that I left my purse out in the open! I am grateful my coworker recognized my purse and returned it to me. 2:45 p.m. — I’m off the clock, and I head across the street for a therapy appointment. I really like my therapist, and we have a good session where we talked about how I haven’t been sleeping well due to stress and a general sense of uneasiness. She sends me home with an assignment to do until our next session in two weeks. 3 p.m. — I drive across town to get my TB test read. After that, I head home. G. texts me that he is free to come over for the weekend, and asks if I want peaches from my favorite farm stand. I obviously tell him yes, then take a nap until he arrives at my house around an hour later. 6 p.m. — G. brings Taco Bell for dinner since he knew I was likely too tired to go out. He bought me a $5 chalupa box, which I don’t quite finish. Dinner is on him this time. We then make two peach pies with the box he brought; one for us and one for his mom. 8 a.m. — G. wakes me up and we get ready to go to the gym. I guide him through a leg workout and we finish off with some cardio. When we get back home, we have a slice of peach pie and coffee for breakfast (healthy I know, lol). 12 p.m. — When we get back home, G. and I make a watermelon, mint, and basil salad for lunch. I bought the watermelon sometime last week, and the herbs came straight from my backyard garden! I power up the laptop to get it set up and realize that someone else must have bought and returned it… and locked it with a password! G. drives me back to Costco where they apologize profusely and exchange my computer for a new unlocked one. 5 p.m. — After the movie, we eat at a new taqueria that just opened down the street. I get a nopales burrito and split carne asada fries with G., and they’re amazing! G. pays for his food and mine, which is around $18. 9 a.m. — G. and I start our day with a Zumba class at 9 a.m. I feel energized and sweaty! I love these dance fitness classes, and I love that I get to do them with G.
10:30 a.m. — After class we go home and have peach pie and coffee for breakfast. Then we shower and spend time relaxing and enjoying a lazy Sunday. G. and I play some games together and then start to debate lunch. I really don’t want to go out and spend more money after my major purchase yesterday. G. offers to pay, but he has been paying for things all weekend. 12 p.m. — After a lot of back and forth, I agree to let G. pay for lunch at a German sandwich shop. We’re trying to support local restaurants in our area, and the food at this place is really good! I get a beef and lamb sandwich with all the fixings, and G. gets a sandwich and fries, which he shares with me. 2 p.m. — After lunch, G. comes over and hangs out with me and my roommate. 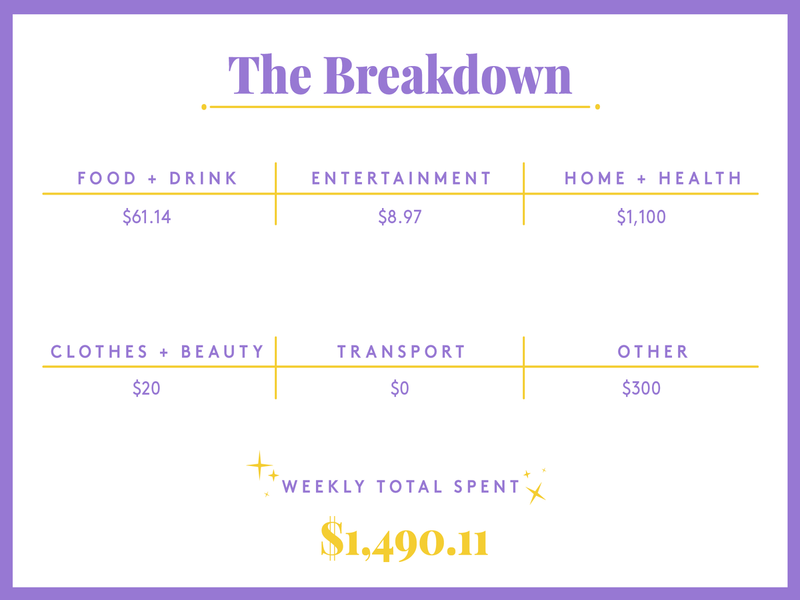 He heads home around 4, and I spend the rest of the afternoon binging Netflix before heading to bed at 11 p.m.
Click here for our roundup of the best money apps.